Model ER6200 is a fixed-length, flange-mounted, electrical resistance probe. The probe is ideally suited for use in high pressure and/or hazardous applications where threaded fittings are not available or not recommended. Process shutdown or process isolation is required to install and inspect. The all-welded construction allows the probe to be used in harsh environments. The probe assembly consists of an insertion rod with an element, a hermetically sealed connector, and a flange (as specified by customer), which are all welded in place. A mechanical seal can be added if required. The insertion length (I.L.) is calculated to the end of the element. Probe length can be specified by the customer. 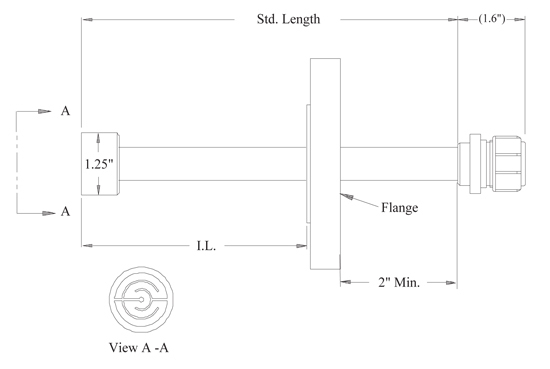 For standard probes, the maximum insertion length is given in the chart below and, in this case, is based on a 1" total flange thickness. Several standard elements are available to meet your specific needs.